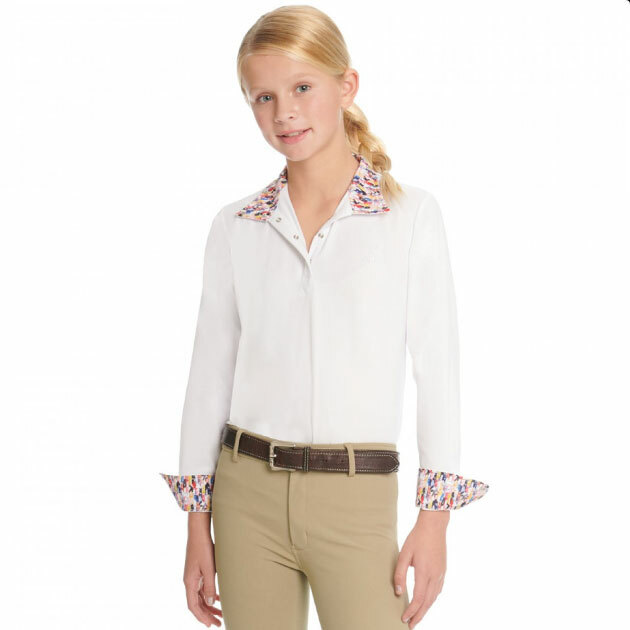 The Ovation Elite English show shirt has classic styling with fun patterned cuffs and collar, plus updated features to keep her cool and comfortable. Dry-Tex™ microfiber mesh sleeves and back creates maximum cooling effect for high performance, plus sheer undersleeves for added breathability and comfort. Made from the moisture wicking smooth stretch jersey front, with trendy wrap collar, this girl's Ovation show shirt is a winner in and out of the show ring. Girl's Size: 16, 18 ONLY! Size 16: Chest 38", Waist 34.5": Body Lenght 25.25"
Size 18: Chest 40", Waist 36.5": Body Lenght 26.25"